Matthew Dercole uses a mold to make bricks. Yoko Fukuta is shaping a bowl. Pei-Hsuan Wang creates while a woman reads to her and the other workers. These plans grace the walls. Detailed model for creating a bowl to hold ox tails. The Locust Projects exhibition space in Miami's Design District is a showcase for experimental, contemporary art, and this week, it's featuring an installation by Theaster Gates called Soul Manufacturing Corporation. The piece asks us to consider the value of things made by hand. Theaster Gates is a Chicago installation artist. Matthew Dercole is making bricks using only crude, wooden instruments. He's what artist Theaster Gates calls a "skilled maker," one of three in this installation. While Dercole pounds out brick after brick, Pei-Hsuan Wang is producing black porcelain ware through a process called slipcasting -- making pottery using a mold rather than a wheel. The third maker, Yoko Fukuta, is shaping clay on a wheel to create Japanese-style ceramics producing what Gates calls soul-food wares. He says he plans to use them in a series of soul-food restaurants he hopes to open back home in Chicago. Gates himself is making a shallow, wide bowl. "It's actually a very apt shape for eating collard greens," said Gates. 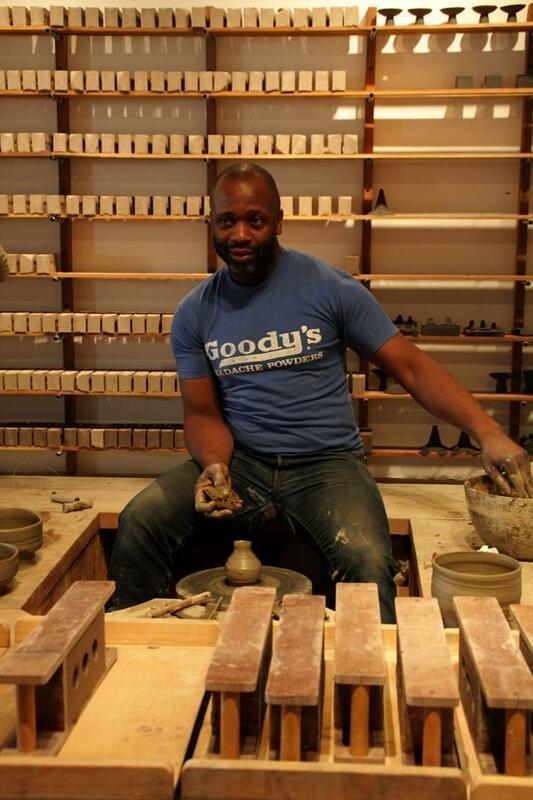 But the Chicago-based artist is more than a potter. His installation examines the act of creating things. He believes making things is making meaning. "Making meaning feels like a very human and very spiritual act. That when one decides to care for materials enough to manipulate them, you learn a lot about yourself and you learn a lot about materials." While the makers are busy creating bricks and bowls, other performers stop by to serve them. One simply reads aloud from Allen Ginsberg's "Howl." Sometimes a DJ performs and the workers take a break to practice yoga with an instructor. Gates says all of this came from the question of what would make the workers more comfortable. "I'm finding that music and attention to our bodies and attention to the intellect, those things together are very, very helpful and can make a fairly laborious day go by faster," said Gates. Even if that laborious day is part of an art installation. Gates has degrees in urban planning, ceramics and religious studies but says he's learned the most from his informal education. His father was a roofer. Gates worked with his dad from an early age with the same expectations and wages as other team members. 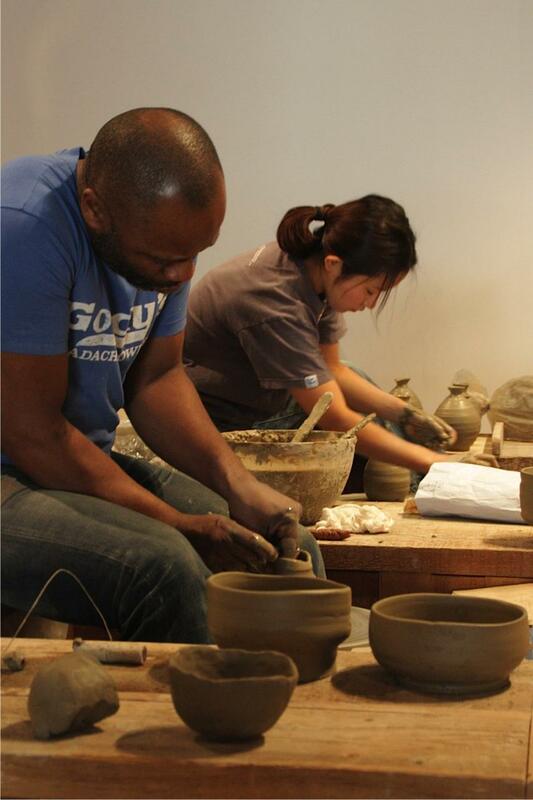 Theaster Gates and Yoko Fukuto mold clay. "How I learned to seal wood by my father or how I learned to paint a baseboard without using masking tape on the floor, these things that are kind of passed down generationally," said Gates. "Sometimes moments like, say, in the black church where my excitement about voice or about ecstasy that those things are more lived than taught. They're more experienced than explained." John Hoffman is a fan of Gates' work and stopped in to see the installation during Art Basel. "Theaster is so much more than an artist," said Hoffman. "He has a vision for really using the art form to stimulate a dialogue about reusing older material, older homes." In 2006, Gates began restoring a group of abandoned buildings on the South Side of Chicago and turned them into showcases for art. These buildings became known as the Dorchester Projects. Gates used materials like timber from Old Chicago factories and records from a neighborhood store that went out of business. Gates hopes anyone who sees his installation in Wynwood will see a deeper meaning in the creation of things like bricks and bowls. He wants his audience to think about the work that it takes to make the things we use every day. "And maybe feel seduced to make things themselves," said Gates. The wares made during Theaster Gates' Soul Manufacturing Corporation will be on display at Locust Projects at 3852 N. Miami Avenue through Friday, December 21.